To purchase this product, view Melody Goggin's about page and see if Melody Goggin is selling products online. 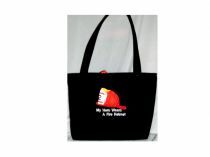 This purse is made from Black Trigger fabric with the Firefighters helmet embroidered on the front with the phrase" My Hero wears a fire helmet" It also has two interior pockets with magnetic snap or tie closure.It is fully lined and ultra firm added for extra stability. The purse measures 14 x 8.5 x 4 with 22" drop down handles. Please contact Mgoggin@homexpressway.net for ordering information. This item was created by Melody Goggin. View Melody Goggin's About page.